Its been a while, but I’m back with another independent bottling. 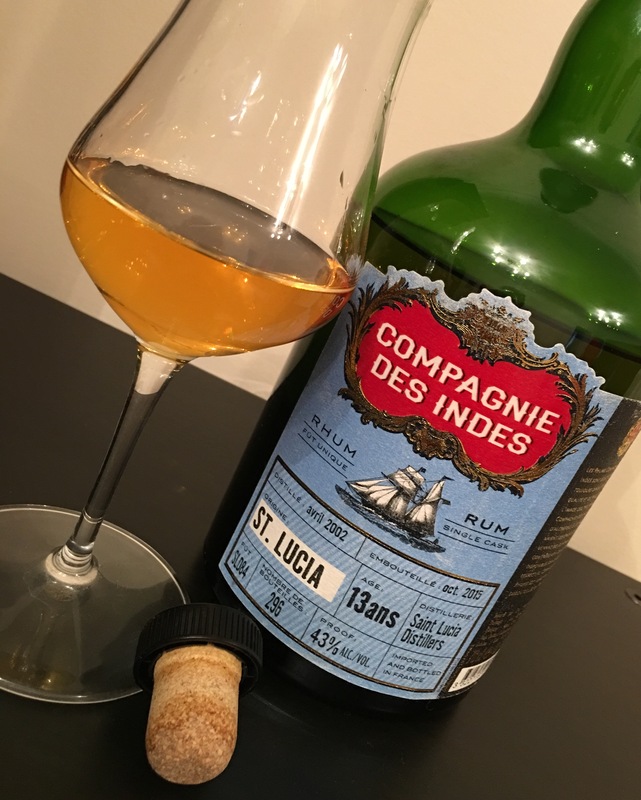 Coming again from the stable of Compagnie des Indes single cask bottlings, this time the delicious Rum within is from one of my favourite producers, Saint Lucia Distillers. 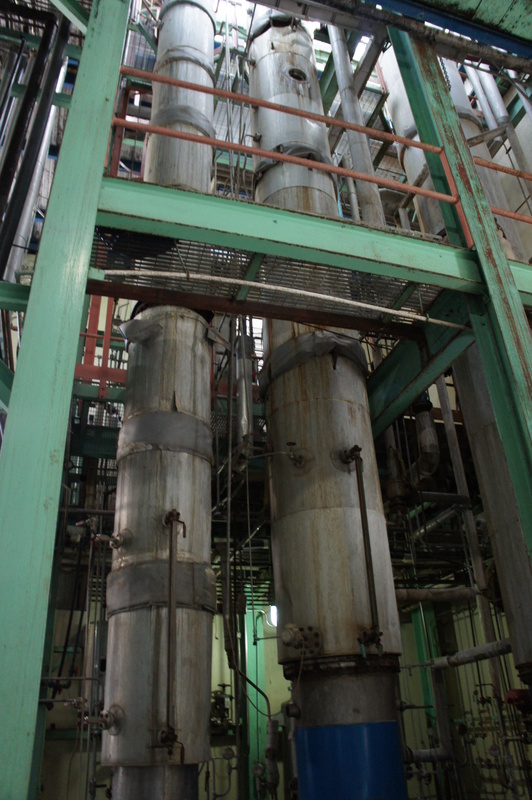 For a little light background reading on Compagnie des Indes as a company you can have a look here and for info on the basics surrounding Saint Lucia Distillers you can look here…..and now that you’re back, we can continue. To kick things off, I’ve been told that every drop of this Rum is the product of Pot Distillation. 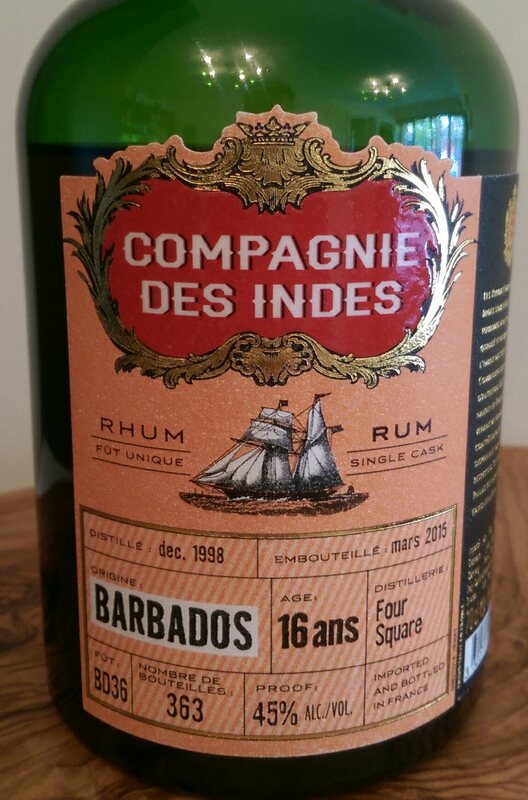 It has seen just upwards of 5 years tropical age which gives it between 7 and 8 years in Europe, a similar level of European age as the quite excellent Compagnie des Indes Foursquare 16. There was something quite unique that the split in location did to that Rum and I hope that it also works here. There was an outturn of just 296 bottles in this cask (an ex-Heaven Hill barrel) and it weighs in at a not unsatisfactory 43%. The keen eyed among you may have also (if you read the linked articles) worked out the still that this Rum is from. As the John Dore 2 still was commissioned in 2004, the Vendome still was commissioned in 2003 and this Rum was distilled in 2002, it must by the process of elimination come from the John Dore 1 still. The interesting thing (for me anyway) seems to be the correlation between small pot stills (think the much fabled small capacity Rockley Still) and the production of really medicinal like aromas and flavours. As an obsessive of anything even remotely Rockley Still related, this really has me excited. Having been fortunate enough to taste both unaged and aged distillates from the John Dore 1 still on the recent Saint Lucia Distillers on Tour event, this assumption of a correlation between Pot Still capacity (John Dore 1 has a capacity of 1500 litres) and medicinal aromas and flavours appears, thus far, to ring true….to me anyway. 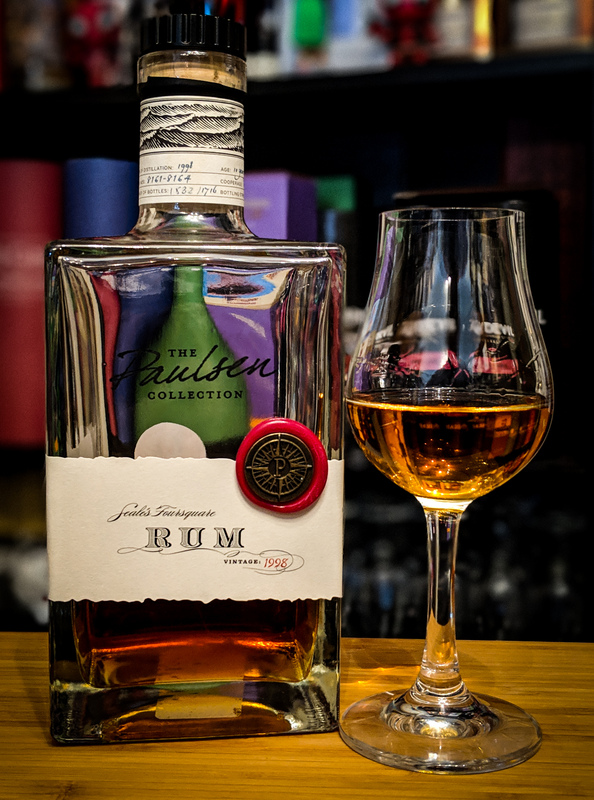 In the glass: The Rum displays itself as a straw gold in the glass and getting your nose anywhere near it instantly gives you a real hit off sharpness and a kick of the signature medicinal note. This medicinal note is present in large quantities and it brings with it a sort of salty, briny smoke. More time with the glass reveals a slightly earthy, medicinal sweetness in the form of root beer. 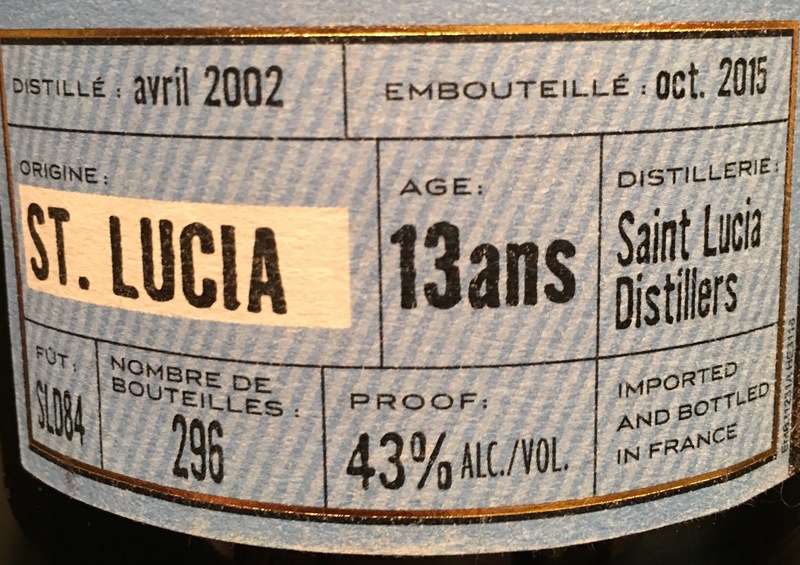 Once you power through this (and it does take its time) you’re rewarded with a hint of something fragrant and flower like…but no real punch of oak is present which surprised me for a Rum of this age. This Rum yet again helps to back up the fact that St Lucia Distillers really are able to produce something special. The character that is carried through into this Rum is astounding. It may be a little one dimensional to keep my interest over an evening and the whole medicinal thing is a real turn off for some people, but fortunately not for me. At around £68 a bottle it’s not the cheapest purchase and it’s not a Rum that I can drink in huge quantities in a single sitting and it is probably best served as a reference Rum. I was hoping for something to completely blow me away in the same way that the Berry Bros. St Lucia 11 sample that I was kindly sent by Wes did, and subsequently the Berry Bros. St Lucia 14 that I now own as a result still does. But this isn’t quite up to the task. Almost amazing, but certainly a worthy purchase. 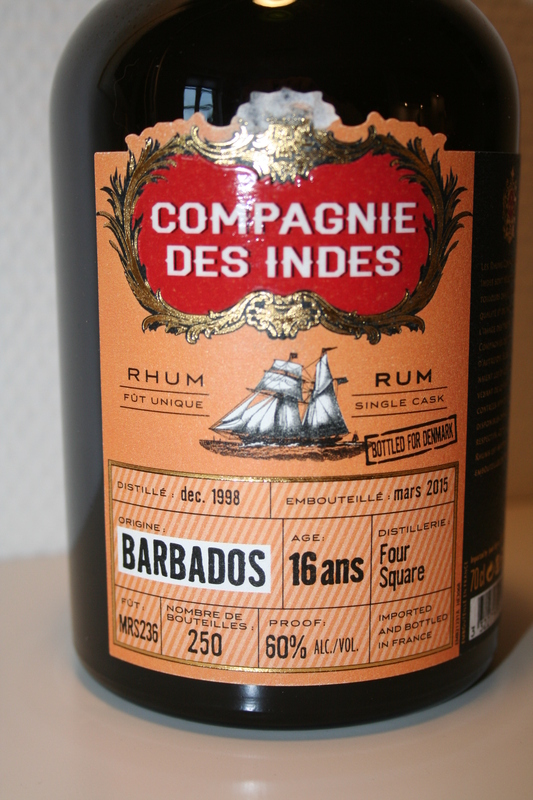 However, comment must again be made about Florent and his Compagnie Des Indes company which really is starting to spread its wings and make accessible some really great Rums. I have previously told the tale of our trip to Paris, and specifically to the Christian de Montaguère store on a previous post. 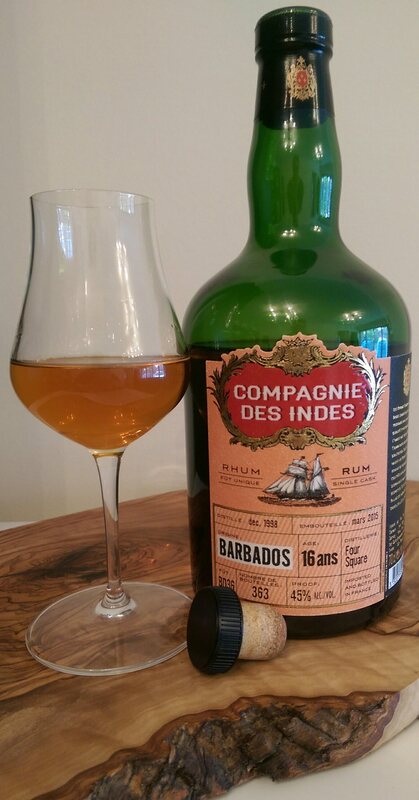 This was the second Compagnie Des Indes release that I picked up on the trip and it was a ‘must have’ for me being as I am, a huge fan of Rums from Foursquare Distillery. It was an instant winner on three counts…..distilled by Foursquare Distillery……aged for 16 years in total AND bottled at 45%…..what is not to like? This therefore will be quite a short intro before we get into things. 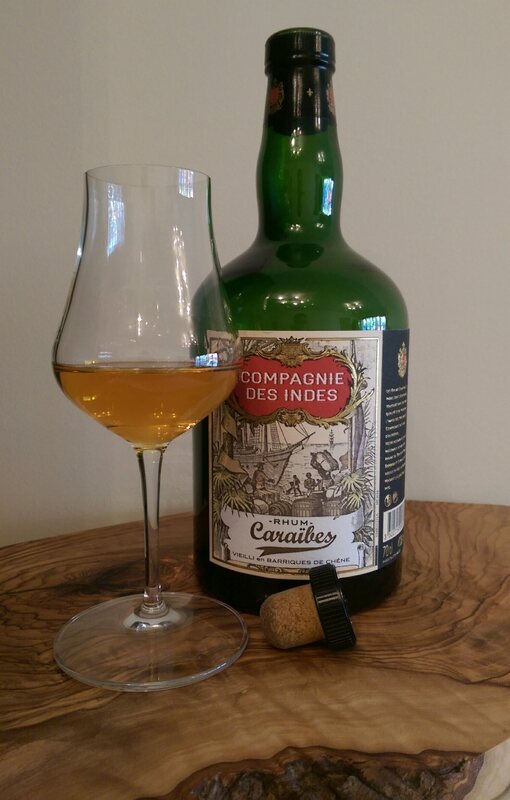 The bottling is an independent release from Compagnie Des Indes and I have recently covered their rather tasty Caraibes Rum on a previous post. You can read all about that Rum, plus get a little background on Florent Beuchet, the guy behind the company and releases here. The Rum was distilled in December 1998 prior to bottling in March 2015 and had been matured for 16 years prior to bottling. 7 of those years were spent in the warm climate of Barbados and a further 9 in Europe…somewhere in Amsterdam or Liverpool. 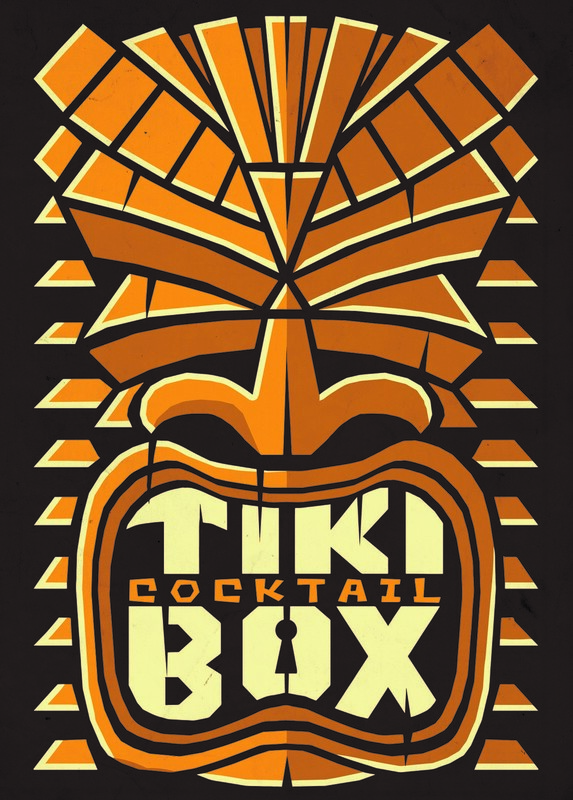 The Rum is a blend of both Pot and Column and was matured in an ex-Jack Daniels barrel. The Barrel Number was BD36 and this yielded an out-turn of 363 bottles. I have information directly from Florent that assures me there is no added sweeteners or colour of any kind. I am really excited about this bottle based on the abv being higher and than any other expression that I’ve tried from the distillery, and also it is the oldest expression that I have tried from the distillery too….. In the glass: The Rum displays as a dark amber in the glass with warm gold flashes. 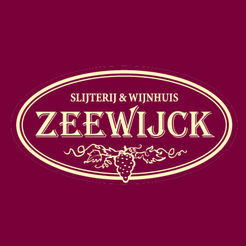 Initial aromas are of fresh mint, orange oils and a very light oak. There is some alcohol up front so I leave the glass for a short while. Going back to the glass there is a clear milk chocolate aroma now backed up with a light vanilla. After leaving the glass to warm slightly in my hand, bananas and a buttery pastry start to appear. Initial forays to the glass show a real freshness to the aromas but as the glass warms, the oak starts to elbow its way in. It becomes the more dominant note along with a hint of warming milk chocolate. It really does benefit from time in the glass and it is really pleasant to just sit and let it unfold before you. Right at the back there is a candied dried fruit peel or something similar along with a very light coconut. Its Foursquare….but not as you know it. I found a few similarities with Rum Sixty Six at its base but it develops more given time. In the mouth: Initial notes are dominated by oak. This carries with it a slight bitterness, but not enough to detract from the overall experience. Working through the oak I can taste bitter chocolate chips and a buttery short crust pastry. Light candied peel and raisins follow. There is a very pleasant all-encompassing mouthfeel to this Rum. Then the dryness of the oak led entry starts to take effect. It dries very quickly and cuts off further developments until right at the back of the finish. Talking about the finish, it is long and very robust. It starts with a light pepperiness which is accompanied by that drying, warming oak. This leads into warm buttery chocolate croissants and the vapours remaining create that familiar peach like note that I experience a lot in Rums from Barbados. Right at the end…..when everyone has tidied up, left the building and taxis have taken them home to their beds, there is a really pleasant feeling of hazelnuts. Even the empty glass is a treat……wonderful oaky notes and just a hint of treacle remain. Given its additional years in Europe taking it to a total maturation time of 16 years, I’d say that this Rum is only a touch more developed than Rum Sixty Six which sees all of its 12 years played out in Barbados. Maybe that change in climate brought something new to the table? As mentioned above, its unmistakably Foursquare….but not as we know it. The core experience is the same, but there is a different flavoured icing on this particular Rum cake. It works and it works well….as does the additional %abv. Florent and his Compagnie Des Indes brand are ones to watch. Their releases are in very limited quantities and from the expressions that I have tried, he knows how to pick them. It was an inspired purchase and one that I would willingly remake when this has disappeared. 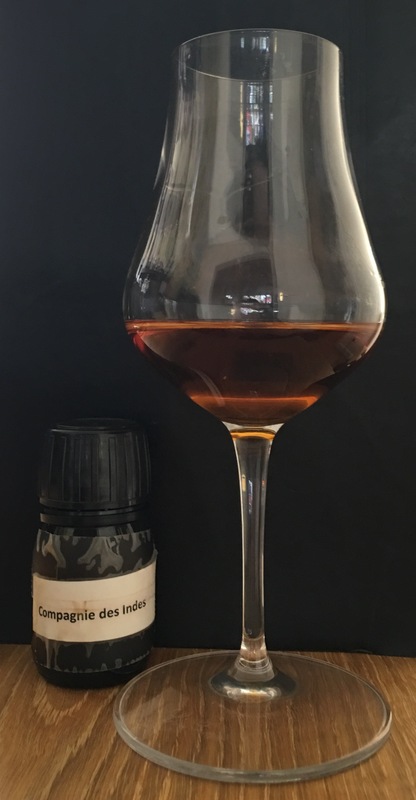 There is also a 60% abv release specifically for the Danish market…..if anyone reading this has a bottle…I would love to trade a little sample with you just to experience that release too. Essentially what I am saying is, if you see it, buy it. DO NOT HESITATE. One thing to add is that I made all of my tasting notes on this Rum whilst using my recently obtained NEAT glass. It assisted with the separation of the alcohol aromas from the delights within. For the purposes of tasting, I would say that it is a worthwhile investment as it reveals more from the get go for those that feel that overly dominant alcohol vapours kill the experience for them. However, for the purposes of sitting down and actually enjoying the experience of drinking a Rum like this, I would always choose my regular stemmed glass. It is far easier to drink from given the NEAT glass has a very wide flat lip and it just fits the bill a little more. If you’ve tried it, I’d love to hear your thoughts.